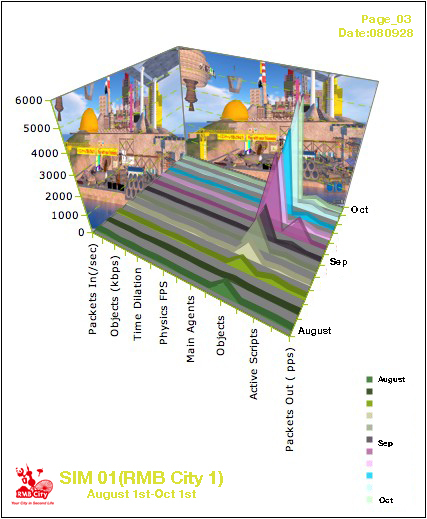 Then we compare this 4 Sims in Sep 28th 2008,with some basic statistics. 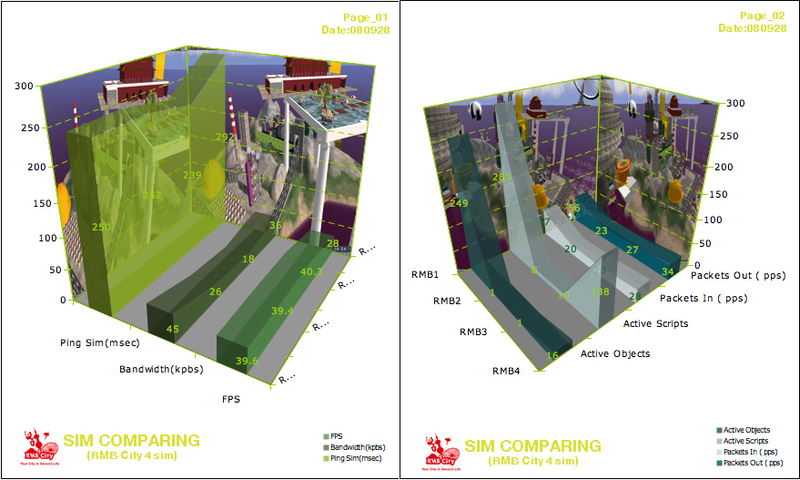 We can found that the 4 Sims have similar speed with SecondLife. However, as the content varied, the Sims had different data, according to issues like active objects, active scripts, packets In and Packets out. Apparently, the RMB 1 (Sim 1) had more objects, while RMB 4 (Sim 4) used many scripts than others. 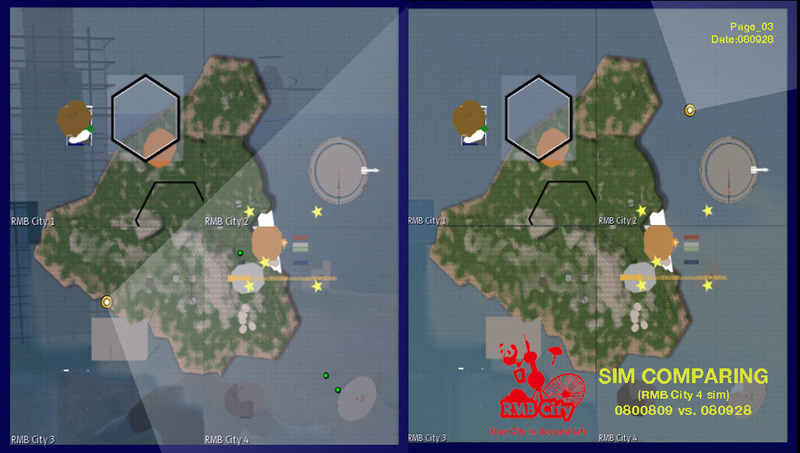 And the Sim map seens the same, comparing the snapshot between Aug 8th and Sep 28th. Besides, the 8 perspective views(North, South, East, West, Northwest, Northeast, Southwest, Southeast) of RMB City 4 Sims had dramatic changes due to the snapshot of Aug 22nd and Sep 28th. 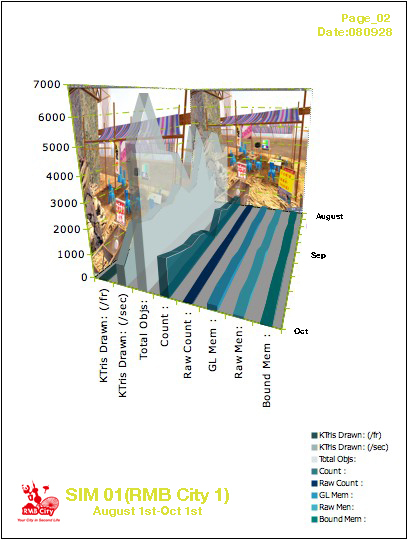 RMB City Key Metrics dating from August 1st to Oct 1st,, mainly used the data of statistic bar (ctrl+shift+1) in Second Life. For RMB City ground breaking was in 14th July, Preview Center opening was in 25th July, we can not record the change of them. However, the Olympic opening and Worksite opening were involved. 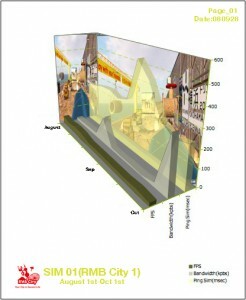 In this article, we took RMB City 1(Sim 1) as a sample to see the process in RMB City construction. 01) FPS: A frame rate between 15-30 frames per second (FPS) is about as smooth as broadcast television. Luckily, the sample statistics of RMB City were frequently over 20fps, and always stay around 30-40fps. 02) Bandwidth: How much data is being transferred between your computer and the Second Life world. This number varied a lot in RMB City 1, varying between 14kpbs to 289kpbs. 03) Ping Sim: How long it takes data to go from your computer to the region you’re currently in. Even though there were waves within 2 months, the data mostly kept around230msec-290msec. Page_02: Displayed ADVANCED information of nitty-gritty details about your Second Life performance. Most of these details are less useful than BASIC or SIMULATOR. 01) KTris Drawn: (per frame) Computer-generated 3D objects are built out of triangles (the basic geometric shape). This is a count of the number of triangles, or “tris”, in each frame of the current scene. 02) KTris Drawn: (per second) This is a count of the number of triangles (“tris”) drawn every second. 03) Total Objects: The number of objects currently in view. 02) Total Frame Time: This measures how much time it takes the region to run everything that the region is trying to do each frame. RMB City was healthy, lower than 22, everything was running as fast as it can, and more scripts can be added without reducing the performance of individual scripts. 03) Net Time: The amount of time spent responding to incoming network data. 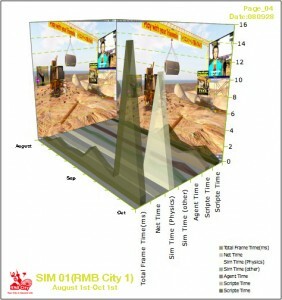 04) Sim Time (Physics): The amount of time that frame spent running physics simulation. 06) Agent Time: The amount of time spent updating and transmitting object data to the agents. 07) Images Time: The amount of time spent updating and transmitting image data to the agents. 08) Script Time: The amount of time spent running scripts. Page_03: Displays statistics for the SIMULATOR you’re currently in. 01) Time Dilation: The physics simulation rate relative to real-time. 1.0 means that the region is running at full speed, 0.5 means that physics is running at half-speed. 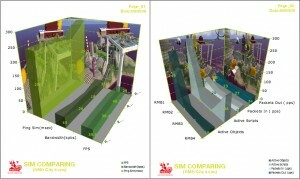 02) Sim FPS: The region frame rate. This should always be the same as the physics frame rate – 45.0 when things are running well. RMB City 1 was always in 45fps. 03) Physics FPS: The frame rate that the physics engine is running at. This should normally be at or near 45.0. 04) Agent Updates/Sec: The rate at which agents on this region are being updated. Normally 20 updates a second, this will decrease if the region has a large number of agents on it. 05) Main Agents: The number of agents (users, avatars) who are on this region. 06) Child Agents: The number of agents who are not on this region, but can see it. 08) Active Objects: The number of moving and/or changing objects on the region. 09) Active Scripts: The number of running scripts that are currently on the region, including scripts attached to agents. 10) Script Perf: Number of LSL opcodes being executed a second by the region. Note that this is the number of ACTUAL instructions executed in the last second, not the theoretical maximum opcodes/second. If your region is not running very many scripts, this number will be low even if performance is good. 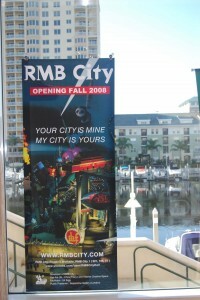 RMB CITY IS ASKING YOU TWO QUESTIONS. 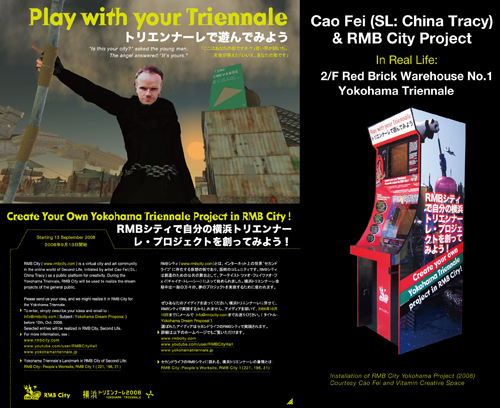 We will appreciate if you can write down your commets，reply on RMB City worksite，or write here directly . 1. What would you like to experience in Second Life? 2. 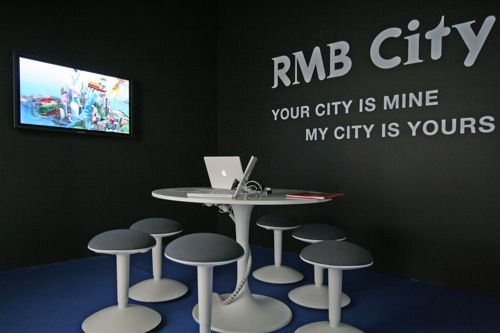 What do you think are the possiblities of RMB City? Fourteen years ago, Neal Stephenson, one of the pioneers of cyberpunk novelists, depicted a virtual world paralleled to modern metropolises in Snow Crash: “……the Broadway, the Champs-Elysees……It does not really exist. But right now, millions of people are walking up and down it.” In it, people exist and communicate as “avatars”, who can present themselves as anything they want. The name that Stephenson gave to this brave new world is “metaverse”—a coinage which is sometimes translated as “fairy land”. More recently, The Matrix struck many of us with shocking imagery of individuals evolved into pieces of code in the gigantic matrix of computers, visualizing a dream-like fusion of the real and the virtual which points to our innermost anxiety and confusion. Now, such a world is ever closer than before, and the pleasure of being a part of it is written on the faces of millions of early adopters all over the world. 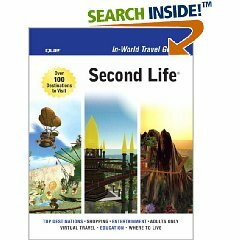 Known as “Second Life” (secondlife.com) in the United States, this 3D virtual online world has a tag line of “Your World. Your Imagination.” With a not-too-steep learning curve, the “residents” of this world imagine, create and own every single object in this new universe. In China, a similar world is called “HiPiHi” (hipihi.com). It has a similar tag line: “The World Exists Because of You.” Started as two separate products, spiritual-wise they are twin brothers, both inherit the hippies’ value of freedom, equity and dream, as well as the very core spirit of the internet. Virtual worlds like these are getting embedded into the real world in a revolutionary way. 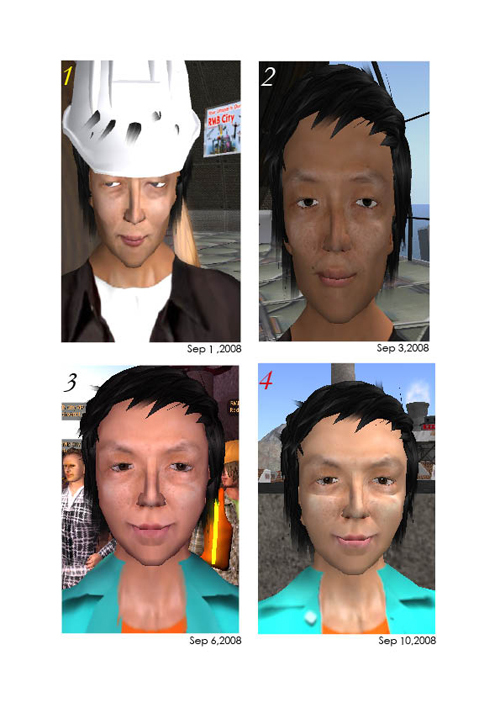 Through the action of creating-trading-socializing, their residents (as avatars) are not only replicating the historical development of our real world, but also revitalizing a number of classic topics in the human history, such as property rights and innovation, prosperity and surveillance, rights and order. Currently, three-million Second Life residents are trading stuff worthy of more than one million US dollar every day. They also write all kinds of programs, spending a year or even more time to stage a ballet with their avatars, creating rain forest on desert, or building grand, entwined castles. As the spiritual descendants of ’60s hippies, geeks have long been waiting for such a world. 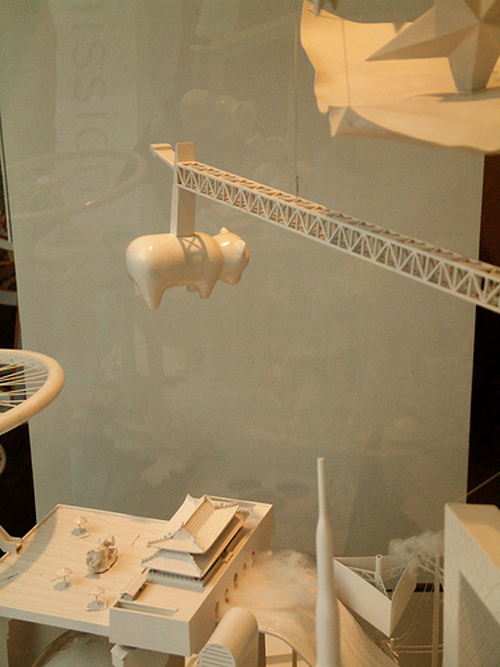 But for many years, small-scale 3D virtual world was a domain for specialists, with application scattering in fields such as architecture, military and computer game. Time is now ripe for “virtopia”-Virtual Utopia-to thrive, which represents the notion of grassroots in two senses: the democratization of hardware and fundamental technologies (large-storage hard drive, high-speed CPU, video card with memory of its own, broadband connection, virtual reality technologies such as 3D graphic), and the triumph of a kind of grassroots production mode: everyone is the creator of the new world. There is no need for pre-plotting here. Residents of this world are creating and socializing every minute, thus also auto-writing the most memorable history. Xu Hui, the CEO of HiPiHi, said that system of user creation in the 3D virtual world is going to be the driving force for mankind’s future prosperity, just as James Watt’s steam engine was for the Industrial Revolution. When people spend half of their time trading, entertaining and socializing in this new world, the distinction of virtual and real becomes blurry. The 3D online worlds also provide the context for the ongoing new round of internet explosion (after its birth ten years ago)-the reshuffling of information and the redefining of the ways people socialize (read: web 2.0). Virtual online world reminds us what kind of dream each content-creating netizen could have, and how they are going to concretize their manifestos of “We are the Web”, “Net is the computer”. After all, in their effort to enable information to flow across time and space, people working in the domain of information technology somehow forgot the fact that it’s “I” that matters, technology is always people-centered. Throughout history, people have always tried to overcome the limitation of space-time continuum with all kinds of new technologies. Space and time are the critical elements that define the state of human survival and self-perception. The advent of metaverse shows us the wonderful prospect of building a brand new platform of human communication based on individual deep experience. For thousands of years, the writing system provided the rational basis of knowledge construction and the infrastructure of our intellectual communication. Nevertheless, it has also suffocated our symbol- and sense-based audio-visual faculties which is as important to intellectual presentation. The 20th century saw the “historic revenge” of audio-visual culture. By integrating human beings’ writing, speaking, seeing and listening modes into one single interactive networking system, the internet recombined the various dimensions of the human mind and soul, thus changing the way in which we experience and re-organize the world. The 2D internet, however, remains a world of text and picture. Human communication, on the other hand, is not only text- and language-based, it also relies on visible body gesture, spatial environment, and their attached cultural implications. With 3D technologies, a channel to the virtual world and inter-spatial / temporal communication is now made available. 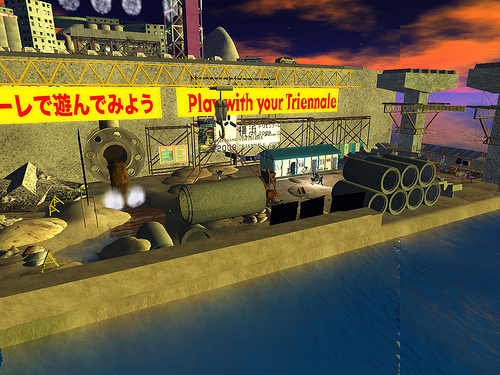 Both Second Life and HiPiHi emphasize the concept of “in-world”, i.e., the reconstruction of “the world”. 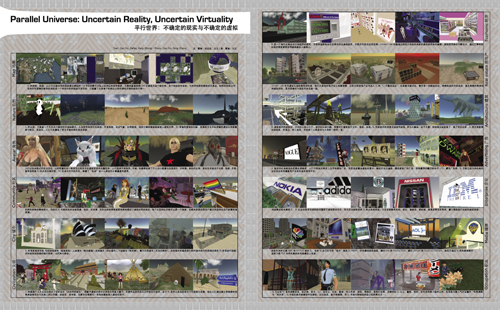 After all, having 3D clones or even modified forms of real-world architectural spaces and natural environments on the internet has managed to visualize the once text- and image-based cyberspace to an extreme extent. On the other hand, by extending themselves into the virtual world as avatars, users gain a new form of existence as well as a richer and more delicate socializing experience. One simple fact exemplifies the profoundness of this augmentation of experience. On the 2D internet, the psychological distance between two users depends on text or language, while in the 3D world, it takes nothing more than single turning back. This is because as the carbon copy of reality, virtual worlds are no longer distinguishable with the real ones. Also, the fact that Second Life and HiPiHi gave birth to not only a new virtual world, but also an unprecedented deep experience for individual, grants them the potential to be the new generation of internet and a brand new platform for inter-spatial / temporal communication and collaboration. Such a highly-visualized platform promises not only the possibility of new business model, but also the opportunity for human dreams and practices such as political experiment. At this moment, those who keep creating and trading after the initial excitement are already the business pioneers in the new world. Powerful real-world business entities such as IBM have jumped on the bandwagon and secured their presence in it too. So did various governments and educational institutions. The discussion on the prospect of this new platform being applied to real problems has already begun. This new world is now going through all the glories and prosperity of the 2D internet. In the digital world, code is power. In order to maintain that prosperity, Linden Lab, the creator of Second Life, is planning to make the source code of their client and server software freely available to everyone. Marshall McLuhan said that media are the extension of the human body. But the body extension and internet recreation in the metaverse will be revolutionary. A “world” where the real and the virtual are connected seamlessly is going to update our knowledge system of body and ourselves, as well as some of the core topics about the digital universe such as social space and communication. This could be a new manifesto about our existence. In the virtual world, people reproduce their bodies. Organs, hairstyle, tattoo, clothes and every single inch of skin are recreated—a newborn body which provides the subject the most powerful capability in the metaverse: complete realness and endless possibilities of variations. As for the real and physical body and the various cultural and historical tokens about body, the mobility and opposition have found new manifestation through 3D avatar. Philosophical concepts such as body, identity and identification have become much more relevant as well as complicated than in the text-based BBS days, when users are represented simply by an ID. A related topic is the possibility to rewrite our knowledge system. Michel Foucault said that human science in the West was born when people began to think of themselves as an object of both imagination and perception. The foundation of modern state administration relies on “body politics” which revolve around discipline and punish. At this moment, it is impossible to know that, in the prime time of 3D virtual world, what kind of crucial interaction is going to happen between intentional social action and system of new technologies, and what kind of new concept of administration is going to emerge. The possibilities of this new world don’t stop at that. Jurgen Haberma once said the development of modern media had destroyed traditional public sphere-the real spaces in which people get together to have rational discussions about public topics had vanished. Meanwhile, just as tap water pipes brought about by the process of urbanization have destroyed well-based countryside communities, urban fireplaces have lost their relevance because of the internet. Some of the most important components of traditional cities, such as civilian’s rights, public spaces and urban landscape are also going through profound changes. But the drastic extension of the metaverse has the ability to reverse some of these facts. The rebuilt virtual body lives in a rebuilt virtual space. With more people getting involved, a new kind of visualized political, economical and social space is coming into shape. Currently in Second Life, the most important symbols of traditional public space-salon, cafe-are thriving, once again, people sit down around the fireplace to have conversation. Friends, relatives and groups return to the visible virtual space, quietly, they take a seat and talk. Although all these happen in the virtual world, the existence of 3D avatar and spaces has restored the sense of “being there”-the most important feeling of human communication, therefore providing a way back to the real-world psychological model and result of socialization. With this kind of kinship to the real world, this virtopia has intensifying the existing problems of the internet. The issue now goes beyond the administration of the virtual. Apart from people claiming identity and sociopolitical rights and their need for sound public order and economical stability, real-world governments are now facing crime committed in the virtual world. Also, with the virtual economy getting more powerful, they begin to have an influence on our first-life economy. “The virtual subverting the real” may be more than an far-fetched imagination. It might not take long before it re-tells the stories of reality into a complex version of The Matrix’s screenplay. 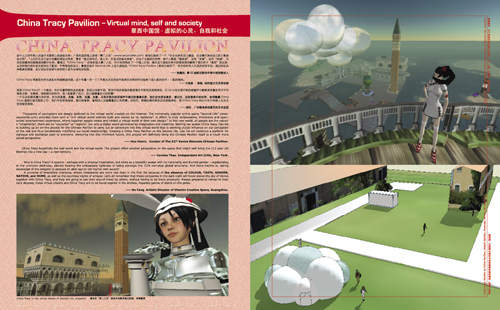 Zafka is among the pioneers who initiated the study on virtual worlds in China. 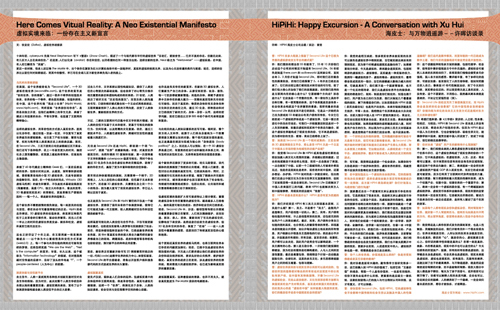 His in-depth analysis articles on virtual world such as Utopian Online, HiPiHi overturns the reality, the metaverse is coming: a new announcement about existentialism, were pressed on major domestic media and thereafter attract lots attention. 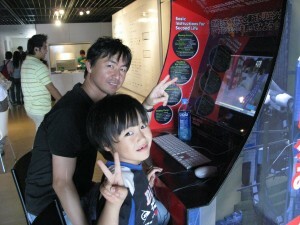 So did his blog, which was the first blog in China that keeps watch on virtual world.